The LED strips are the big reason I still pick-and-place everything by hand. My tolerances here are just a few mils, and I've machined myself steel-and-aluminum templates to make the placement easier. The idea is actually to place with looser tolerances, dropping the LEDs into the trough where the strip is clamped the check spacing and orientation with the microscope before reflow. During reflow I tighten the guides on the jig and level the LEDs using a little precision squeegee I made out of aluminum and high-temp silicone. 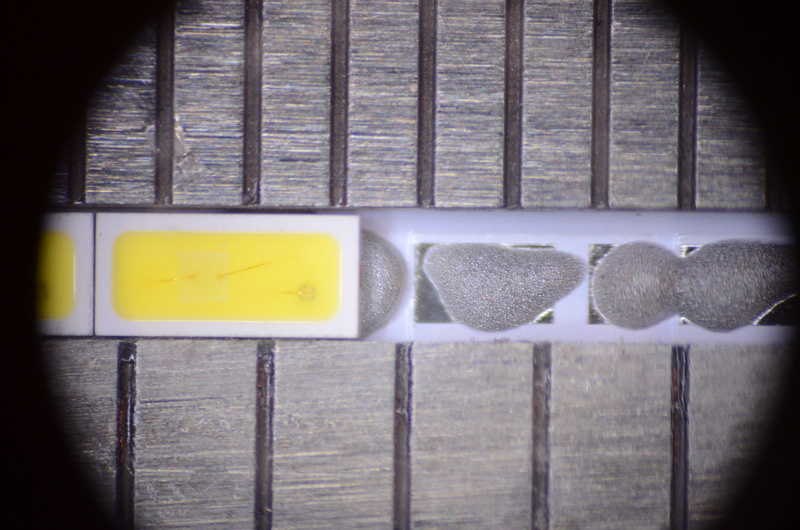 Once the strip cools, I can pull it out of the jig, remove excess solder beads under the microscope, check for obvious defects, test on a power supply, and wash down with flux remover. Then it's on to applying the teflon layer, soldering pigtails, an up-to-temperature burn-in and flex test, and finally packaging.